Irina Petrunicheva hails from the town of Sokol in the Vologda Region. She studied acting at the St. Petersburg Academy of Theater Arts. Upon graduation in 1999 she joined the troupe of the Theater Moderne in Moscow. 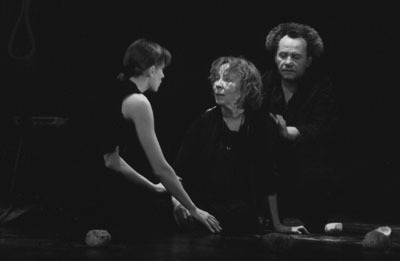 Two years later, in the fall of 2001, she joined Moscow?s Vernissage Theater where she has performed in Victor Hugo?s Maria Tudor (as Jane), Pyotr Gnedich?s An Old Tale (as Marya Nikitichna) and George Bernard Shaw?s Mrs. Warren?s Profession under the title of Her Secret Business (as Vivi). Her newest work at the Vernissage is in Lee Gan Pek?s The Wedding, directed by Kim Van Sok of South Korea. It premiered in the spring of 2004. Petrunicheva has performed in several films made for television, including The Return of Mukhtar, The Liquidator, Late Supper and Vladimir Dostal?s Stilleto. Her debut in a feature film took place in 2003 in Grigory Ilugdin?s Reprise where she played Sima Solomonovna.